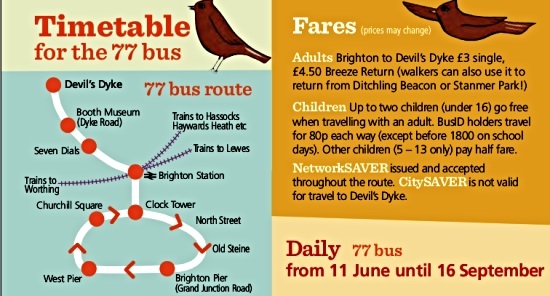 As from today, there is a full daily bus service from the Dyke to central Brighton. Buses run (roughly) every 45 minutes and National Trust members can park up there for free. Here’s the timetable [PDF]. The service reverts to weekends only in mid-September. This entry was posted in Devil's Dyke, Home Page, National Trust, Poynings, Transport. Bookmark the permalink.